It has become almost impossible to keep up to date with the latest vulnerabilities and risks that are a threat to your website and the actions you need to perform in order to protect it from such threats. Combell’s new “Automatic Patching” service is therefore most useful. But what exactly are we talking about? New vulnerabilities or weaknesses are being discovered in web services, protocols, scripts, applications, etc. every day. All sorts of criminals and malicious people can take advantage of the vulnerability and temporarily bring your website down, which means a lot of lost sales. They can also gain access to your customers’ information and steal or corrupt data. Sometimes, the financial damage can be significant. And the worst thing is that you would not have to go through all this trouble if a patch had been applied in time. Patching basically means updating the existing software to fix errors or bugs in that software. Those who do not take the appropriate measures to address those vulnerabilities are in serious danger. Unpatched systems are indeed among the main vectors criminals use to gain access to your website. It is thus highly recommended to perform patching as soon as the vulnerabilities have been detected. Unfortunately, even the most alert website owner cannot follow all the news about security and immediately know which component is vulnerable. This is why Combell now provides the Automatic Patching service. Automatic patching: a new step towards a more secure world for all Combell customers! This new service, which is available on all Linux hosting packages, checks all the files on your website for you. and if hackers can exploit them. Vulnerable files are listed in your control panel. From here, if you want, you can also request Combell to automatically patch the files concerned. Normally, automatic patching is already active on new hosting packages. On existing hosting packages, it is already active for all end customers. As for resellers, they can offer the service to their customers via their service package or as an add-on. Check if your Autopatching is active: go to Site Settings > Autopatching tab: the green button above, next to Activate Autopatching, should be set to ON. Automatic patching (recommended): Combell will automatically apply the necessary patches. Overview tab: shows you a list of absolutely all the problematic files. Vulnerabilities tab: shows you a list of the files that need to be patched. You will also see the date and time when the problem was detected. A green dot before the file means Combell has already solved the problem. If you cannot see this symbol, you can patch the file using the Patch After that, the Undo patch option will appear next to the file, so that you can restore a backup of the file if any problem occurs. Quarantine: the file is temporarily stored in a secure environment, where it is harmless, so that you can retrieve it later if necessary. Beware: automatic patching ≠ CMS update! 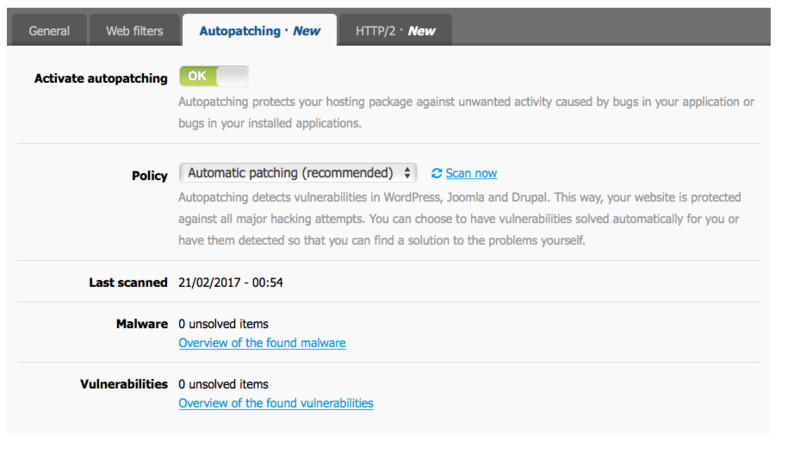 Automatic patching specifically focuses on files on your website (scripts, PHP files…). You still need to update your Content Management System (WordPress, Joomla, Magento…) yourself, as well as the associated themes and plugins. However, Automatic Patching helps patch vulnerabilities that might cause great problems faster than if you had to do it yourself, through manual monitoring. In addition, issues found in older versions of the CMSs are also detected and fixed. Activate Automatic Patching now and check if all your files are 100% secure! Automatic Patching is just one aspect of the ultimate security that Combell hosting offers. Discover all tools included in Combell Shield.